A boy-cook, a girl-captain, and a galaxy. In the age of near-space colonization, a young man becomes embroiled in mystery and romance on board the oddly-named, corporate warship, Nadesico (named for Nadesico flowers). Surrounded by talented, eccentric shipmates with diverse backgrounds and clashing lifestyles, Akito juggles his joint responsibilities as ship's cook and pilot of the advanced robot suit, Aesti Valis. Leading this motley crew is the brilliant, but erratic young captain, Yurika, a childhood friend of Akito whose romantic interest has not faded with age. She is not alone in her chase, as several other crewmembers also vie for Akito's attention. Against this teenage angst-filled backdrop, the ship pursues its mission to discover the secret origins of the past and current Jovian wars and the fate of Akito's devastated former homeland, Mars. M.S. 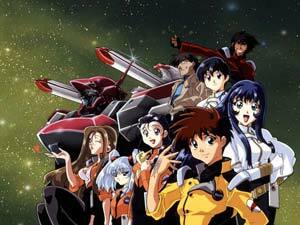 Nadesico is a healthy mix of science-fiction, comedy, romance, and campy adventure between the planets. Although included in this collection, in truth Nadesico was a collaborative project for which Mr. Asamiya claims secondary credit. According to interviews, the basic premise was bounced around for a while among several people, eventually resulting in the something-for-everyone Nadesico story. At a con, Mr. Asamiya paraphrased a collaborator's description of Nadesico as Ataru from Urusei Yatsura on the Space Battleship Yamato fighting with Gundams. I can't say if this is a totally accurate description, but it's funny enough, and the Yamato itself makes an appearance. Nadesico is practically a franchise at this point, with tons of related merchandise available. Much of that is devoted to the cynical, emotionally withdrawn, child genius Ruri, who seems to be especially popular among male and female fans alike. Even though Nadesico is full of homage to earlier stories, or perhaps because of that fact, it is often used as a source for further parody in fanfiction and fanart. The series is over, but as long as Ruri keeps making cameo "baka" appearances, the Nadesico crew will keep bumbling along.